For over a decade, the World Bank Group’s Doing Business index has served as quintessential tool for determining how well a country’s institutional infrastructure is suited to the promotion of a productive business environment. But something was missing. Businesses and governments interact on levels beyond permitting and regulation: the public sector can also be a client. Public procurement can provide opportunities for corruption. When seeking lucrative public contracts, companies look for any opportunity they can take advantage of that will improve their ability to secure a successful bid. Unscrupulous government officials can use their influential positions to attain favors and gifts from businesses pursuing public procurement tenders. In March 2015, the World Bank Group, in conjunction with the George Washington University Law School, held a release event for the first installment of its Benchmarking Public Procurement Index. The index was designed using the methodological foundation of the Doing Business Index and indicators. For each country, the primary business metropolitan centers are used as proxies (New York, Amman, Mexico City, etc.) for national procedures. The pilot program assesses 11 economies (Afghanistan, Chile, Ghana, Jordan, Mexico, Russia, Sweden, Thailand, Turkey, Uganda, and the United States). Next year’s assessment will look at 82 countries, and the following year, and all subsequent, it will expand to 189. The index takes on the issue of public procurement from the private sector point of view and has a greater focus on outcomes. It “aims to help identify areas for reform and promote more transparent, competitive and efficient public procurement systems” (emphasis in original) and to draw comparisons between countries. The first objective of the index serves to highlight any discrepancies between the laws on the books (de jure) and how the process works in practice (de facto). Second, it focuses on three key aspects of doing business with the government: 1) ease of bidding for a public procurement tender, 2) integrity in the public procurement process, and 3) complaint systems. Ease of bidding refers to issues of accessibility, clarity of regulations, and the procedure, time, and cost of bidding. Integrity focuses on issues regarding oversight mechanisms, conflicts of interest, consultation with the private sector, etc. Complaint systems refer to the processes for challenging a procurement tender (procedure, time, and cost). Prior to the development of this index, most of the work on public procurement has been piecemeal with little discussion of global comparison. The European Commission, for example, compiled an analysis of public procurement procedures within the European Union. 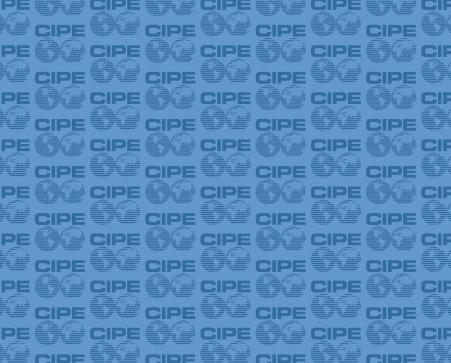 In 2011, CIPE and Transparency International worked together to perform detailed analyses of public procurement transparency in four APEC countries (Vietnam, Indonesia, Mexico, Peru) that emphasized areas for improvement and recommendations for steps that can be taken by the public sector, private sector, civil society, and the donor community for each country individually. Takeaways from these four studies touch on many of the same subjects exhibited in the Benchmarking Public Procurement index. More recently, in 2013 CIPE partnered with the Riinvest Institute in analyzing the public procurement process in Kosovo where they used the previous work with Transparency International to develop the methodology and approach to reform. The index and the aforementioned case studies emphasize the role for international and national standards in the procurement processes as well as the procurement process from the private sector point of view. The difficulty in procurement process reform lies in finding a healthy mixture of top-down and bottom-up reforms. Many governments are reluctant to adopt standards imposed upon them by the international community. And merely instituting the language of standards does not necessarily change the situation on the ground. Countries must be willing to institute change, not just pay lip-service via semantics. In this space, substantial opportunities still exist for the private sector and civil society to improve the relevant processes. Commitments by the private sector for transparency and to the practices of responsible corporate governance can create the environment necessary for local demand for reforms. Civil society ultimately bears the cost of public procurement irregularities. At the local level, citizens are the primary recipients of public services – trash pickup, water treatment, etc. – and the users of infrastructure projects. Collusion and corruption affect the quality of services provided, often to the detriment of service recipients. Fair and open public procurement processes may not always provide the highest quality, but at least competition among the bidders can provide the impetus for service improvement. Allowing for civil society inclusion in the procurement process provides a feedback mechanism for both the public and private sectors. Open dialogue amongst the three pillars of society provides the greatest opportunities for reform and helps to ensure quality and fairness. Such high-level recognition of the importance that public procurement processes have in combatting corruption could be an important catalyst for change. Countries use the Doing Business index as a means of pinpointing targets for reform, and the Benchmarking Public Procurement index could generate a similar effect. Kriby Bryan is a Knowledge Management Intern at CIPE.